Today’s weather will be brought to you by something we don’t often see in Maine, a dryline. A dryline is a front that separates areas with higher dew points from areas with lower dew points. The two airmasses are different densities despite having the same temperature and that difference can trigger storms. Drylines usually occur in the plains where they can form massive storms as moisture laden tropical air from the Gulf of Mexico crashes into bone dry air from the Desert Southwest. 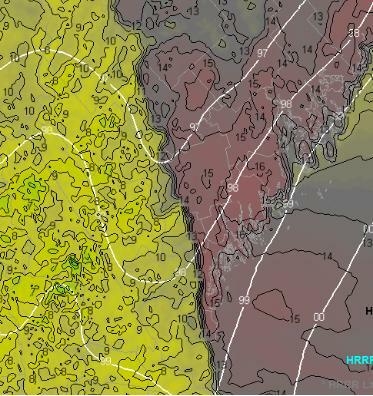 HRRR Showing The Dryline This Afternoon Over Maine. Our dryline will work the same way but on a much smaller scale. Residual moisture from last night’s storms will be ahead of the front while drier air moving in from the SW will attempt to push it out of place. 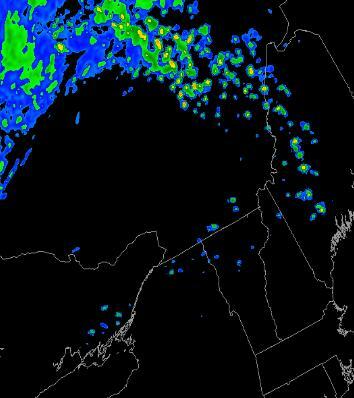 The result will be some scattered showers and storms this afternoon across Maine. NH should stay mostly dry. Showers will develop early in the afternoon and will be most likely in NE parts of the region though anyone in Western Maine could see some raindrops. They should be short lived and not too bothersome so today is definitely a go in terms of outdoor activities just keep an eye to the sky and be prepared for a quick 10-15 minute downpour should it occur. Bigger storms are likely tomorrow and the SPC has highlighted ME and NH as having a marginal risk for severe thunderstorms. More on that tomorrow morning. Even more thunderstorms, again possibly severe, are expected Wednesday and more significant synoptic scale rain is possible next weekend.